Technology disruption, rise of millennials, and competitive marketplace are leading to disintermediation in the value chain and business model of traditional banks. To keep pace with the digital change, banks are aligning with digital-first operating models, adopting cutting-edge technologies, and fostering new digital-savvy culture. Moving to digital innovation requires executing big changes in strategy, operations, and organization, impacting the entire enterprise. As the pace of digital transformation intensifies in a few enterprises, it produces leaders and laggards. Within this context, we have what differentiates Digital Pinnacle Enterprises™ from their peers. To better understand enterprises’ digital strategies, Everest Group conducted a study of 55 banking and capital markets organizations across North America, Europe, the United Kingdom, and Asia Pacific. 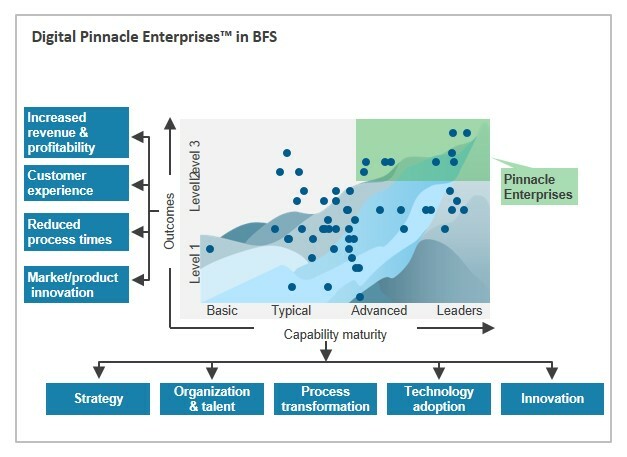 We identified 18 key dimensions in which enterprises are making investments for digital transformation, and further identified five key dimensions where Digital Pinnacle Enterprises™ in BFS differentiate and reap higher returns than the industry average. We evaluated enterprises on capabilities such as strategy, organization & talent, process transformation, technology adoption, and innovation. This report presents key findings from this digital enterprise study.